This was my 5th VT City Marathon. It’s funny how each time I run it I seem to forget that the course has a lot of rolling hills. My recollection usually is “there is only that one hill on Battery Street”, but I am clearly wrong! This marathon has a lot of rolling hills and is NOT flat. The hotels in the area are pretty reasonable if you purchase them with plenty of time in advance. This year I waited too long and ended up staying at the Travelodge in South Burlington. Of course the website had the hotel really dressed up, so I thought I was staying at the same type of hotel that I stayed at a few years ago. I recalled the nice fluffy one with the fake fireplace in the lobby and fresh cookies when you check in. WRONG! As we drove up to the hotel I said “OMG, please don’t let this dump be our hotel”! Well, sadly it turned out to be our hotel. It was completely run down on the outside. We checked in and the woman was so nice! She actually let us cancel our room so we could bunk with our other friend Angie, to save money. She had paid quite a bit more for her room and she was pretty relieved to split the cost when she got sight of the conditions! The woman at the front desk also offered an extended late checkout; instead of 12:00 we got to stay until 1:00! The room on the inside was much nicer than I expected; microwave, refrigerator and a coffee maker. I know it’s your basic hotel amenities but some more expensive hotels don’t have these without a charge. The bed was another story. I laid down on one to test if out and when I went to get off I almost flipped the mattress. It was not put back on with brackets so as a result - I almost ricocheted off! Nice way to get the adrenaline pumping for the race the next day. The expo was the same as the previous years with a lot of the same vendors. What was new this year was the VT untapped maple syrup nutrition that was being offered on the course. I bought a few samples of their gels, waffles and Lemon Tea Mapleaid. FANTASTIC. We are taught when training for a marathon, “never try anything new on race day”. Well, I did and was pleasantly surprised that I had NO tummy issues. The ingredients in these products are all natural. I loved their maple waffles they had on the course too. I never felt like I was starving or hitting the wall as I’ve experience in past races. Next, we drove to the Peoples Bank to get our VT City race poster that we get each year. This year was not the typical water color poster, it was a special edition as they were celebrating their 30th anniversary of the race. The morning of the race we parked downtown. Our hotel wasn’t on the list for the bus pick up and we were going to be tight with our schedule so we drove to save time. We parked at the garage that is FREE for race day and we walked to the start. The weather was overcast and had a slight chill in the air. This to me says “perfect running conditions”! There was a bike store that was playing Queen’s song “I want to ride my bicycle” pretty loud. Since we all love Queen, I felt it was a good sign that the race was going to be awesome! At the start we jumped in with the 4:00 hour pace lead. The crowds were thick with support at the start and then the horn went off. We headed out with sounds of cowbells, cheering and my favorite sound of the church bells ringing! It’s somewhat magical. We headed up to the first section of the race through the famous "Church Street" where people cheered as they ate their breakfasts outside. There were a couple of cross dressers that were extremely colorful that cheered us on too. Running in front of us was a man wearing only tight brown underwear, a fluffy tail and was running barefoot. Quite the scene! There were lots of costumes on the course; runners dress up as hot dogs, relay themed outfits, and even a man dressed up like a Hooter girl! We headed into the neighborhoods and weaved our way through the congested bundle of runners. The runners in front would yell back “Hole!” or “Sign!” to warn us of the obstacles ahead. I was pretty thankful they did this since it prepared us for the unknown. I couldn’t believe they left the large pedestrian walkway signs in the middle of the road. Makes me wonder if anyone ran into one. We recognized more CT runners and were pleasantly surprised to see Mary Anne who we met while running the Big Sur marathon and later discovered she was from CT too. I love how we all connect year after year at these races. It’s like we were meant to see each other offering support when we need it. It definitely put a smile on my face after we parted ways. The next section is the beltway. On a hot day this section could be brutal. This year with cooler weather it went by fast. I like this part as you can see the leaders coming by as they have already turned around and are headed back. Also, new this year, were drummers in the middle section that seemed to be in sync with the beat of their drums to my foot strike. It made for mindless effort for the out and back as I had that drum beat playing in my head over and over. As I mentioned earlier, here was one of the surprises of “where did this hill come from”? It wasn’t a steep hill, just a gradual incline for about mile. On the way back, I loved looking for friends that I knew were running and yelled out to them. Getting a big smile back from them was pretty cool. People were yelling to us too! It’s nice to be recognized at an out of state race by so many people. 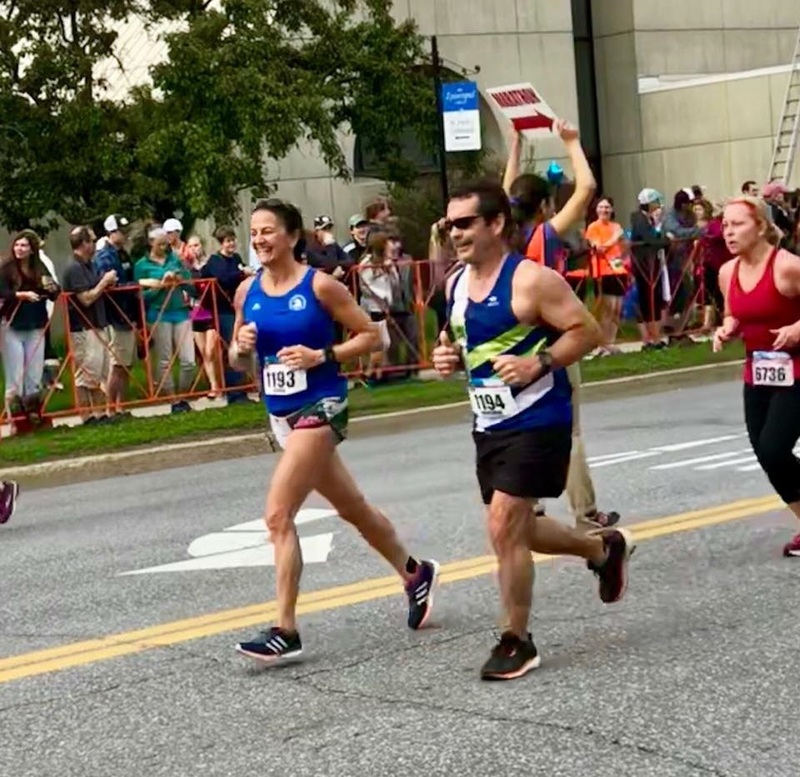 I was so excited to see my friend Michelle yell back to us with that big smile, as she was running her first marathon! So cool to have our VT friend Suzy yell out "Go Jeanne & Kim"! We met Suzy 5 years ago on the course and we since keep in contact. She's run 15 VT City marathons. This was the first section, around mile 6 where they had the VT untapped fuel. LOVED IT! We got off the beltway and headed back to Battery Park by the start and then onto Church Street again. Next, we head south on a long straightaway to another neighborhood where we could start to see Lake Champlain. After a few more turns we head down by the water and then back up towards Battery Park to "the" hill (the only one that I seem to remember!). As you approach the hill you can begin to hear the drums. Spectators are aligned on both sides of the street cheering and encouraging runners up the famous hill. Kim and I powered up that hill and we entered Battery Park again running on a small footpath. We exit the park to yet another long straight away and back into more neighborhoods. There is so much support here! This race is pretty cool as these VT neighborhoods are supporting runners with fruit, popsicles, entertainment, water and even beer! The entire town participates one way or another. It’s awesome. I start getting excited around mile 18. This is when I think “we only have 8 miles, then the miles start to go by faster and faster; one mile at a time. I visualize our 7 mile lake loop we run at home and create visuals, placing myself mentally at each mile of the lake. Around mile 20 we headed out towards the bike path. We are on this beautiful path along the edge of Lake Champlain from mile 22 until the finish. Some runners feel these last miles of a marathon are the most difficult. I find these miles to be the most incredible. The views on the bike path of Lake Champlain are breathtaking. The air was clear, skies were still overcast and there was a nice breeze that kept me cool. As the finish line was getting close and the cheering could be heard as we approached the last couple miles. I felt bulletproof this marathon. It’s not often when I still have fuel in my tank. This race I did. I’m not sure if it was the nutrition or that I that I didn't go out too fast. I am going online and stocking up on the Untapped Maple Syrup for my next marathon! We got to the last .2 miles and the crowds were fantastic. They were on both sides of the fenced in areas SCREAMING with enthusiasm! We turned the corner and saw the finish line. (Click HERE for the link) I kicked up my pace, Kim grabbed my hand and the crowds went crazy! We sprinted to the finish line! It was such an exhilarating moment. We ran a negative split - Marathon #54 is DONE! WHEN IS MY NEXT ONE???? Oh wait, San Francisco Marathon - HERE WE COME!